The Master of Engineering Technology is not accredited by any professional bodies other than the University of Southern Queensland. a knowledge of fundamental technology management issues. Possess a three-year degree in engineering, science or technology in the same field of study as their proposed major study, or a four-year degree in engineering, from a college or university recognised by the National Office of Overseas Skills Recognition (NOOSR) as awarding degrees that are comparable to the education level of an Australian bachelor degree. Candidates for admission must have demonstrated a high level of academic performance. The Master of Engineering Technology consists of 12 units of study as indicated in the following recommended enrolment patterns for each major study area. For their first time, students studying full-time on-campus will enrol in four courses from Schedule A and Schedule B of the Recommended Enrolment Pattern of their chosen major. The four courses should include ENG8001 Engineering Research Methods. On successful completion of four courses including ENG8001, students may choose either the Engineering Technology Studies Path or the Project and Dissertation Path. 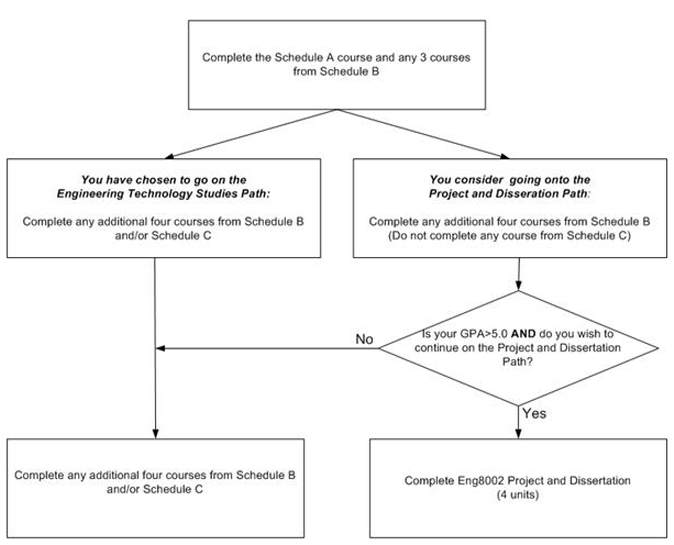 The Project and Dissertation Path will normally be available only to students that achieve a GPA of at least 5.0 across their previous courses. Full-time on-campus students taking the Project and Dissertation will normally enrol to do their project in their third term of study. In exceptional circumstances, the Program Co-ordinator may grant permission to take the project in the second term. Students studying part-time externally will follow an equivalent program extended over six terms. Students must complete the part-time external program within a maximum period of 12 terms. Full-time students have a maximum of 3 years to complete this program. Part-time students have a maximum of 6 years to complete this program. A pro-rata adjustment of the maximum time period will apply for those students who transfer from one mode of study to another. A pro-rata reduction in the maximum time period will apply to students who are admitted to a program with advanced standing. The Faculty of Health, Engineering and Sciences offers an articulated program of studies leading to the awards of Graduate Certificate of Engineering Technology and Master of Engineering Technology. These programs of study are suitable for graduates of three-year engineering, technology and science programs who wish to further their studies in engineering, and for graduates of four-year professional engineering programs who wish to continue their studies in a different discipline area. The Graduate Certificate of Engineering Technology consists of four units of study. The Master of Engineering Technology is composed of 12 units of study with the option for either all coursework (via an Engineering Technology Studies Path), or eight units of coursework and a four-unit Project and Dissertation. The fully articulated program is intended to allow students to enhance and extend their knowledge of a particular engineering discipline area. .
Students who, for whatever reason, are unable to complete the Master of Engineering Technology and who satisfy all of the requirements of the Graduate Certificate of Engineering Technology may be permitted to exit with that award. Graduates of engineering degree programs who are eligible for professional membership of Engineers Australia will not be permitted to undertake a major study in the same discipline area as their undergraduate degree. See Enrolment Flowchart for further details. The Master of Engineering Technology consists of 12 units of study as indicated in the following recommended enrolment patterns for each major study area. For their first term, students studying full-time on-campus will enrol in four courses from Schedule A and should include ENG8001 Engineering Research Methods . On successful completion of four courses including ENG8001, students may choose either the Engineering Technology Studies Path or the Project and Dissertation Path. The Project and Dissertation Path will normally be available only to students who achieve a GPA of at least 5.0 across their previous courses. Full-time on-campus students taking the Project and Dissertation Path will normally enrol to do their project in their third term of study. In exceptional circumstances, the Program Co-ordinator may grant permission to take the project in the second term. Permission to enrol in ENG8002 , must be obtained from the Program Co-ordinator. Students should note that the choice of courses for full-time, on-campus study may be limited due to timetabling constraints and that not all courses will necessarily be offered each year. ** Permission to enrol in this course must be obtained from the Program Co-ordinator. ** Permission to enrol in this course must be obtained from the Program Coordinator. + Electives will be approved by the Faculty of Health, Engineering and Sciences and will normally be Engineering, Science or Technology courses not lower than Level 3.